Looking for a filling & healthy soup recipe, then your search ends here! Veg Manchow soup is a complete meal by itself and its very popular in Indian Chinese restaurants. It is prepared with lots of vegetables and very quick to prepare at home. This thick soup tastes heavenly delicious with hot, spicy and sour topped with crispy fried noodles. Its an ideal recipe for weight watchers. When we go out for dinner, its our kids first choice in their menu due to its highly addictive taste. Lets see how to prepare delightful Veg Manchow soup with this simple video recipe! Add grated garlic and saute till light brown. Add grated ginger and toss for few seconds. Add finely chopped spring onions and toss. Add sliced onions and saute in medium flame until transculent. Add finely chopped veggies like cabbage, beans, carrot (you can add any veggies of your choice) and sweet corn & peas. Add salt, red chilli flakes and pepper pwd. Add 3 cups of hot water and cook the vegetables in pan covered for 2 minutes. Take care not to overcook the vegetables. Now add sliced capsicum and cook for a minute. Add soya sauce, vinegar, red chilli sauce, sugar and white pepper pwd. Make a thin paste of 1 tbsp of corn flour with 1/2 cup of water. Add corn flour paste to the soup and stir good. Allow to cook for 2 more minutes and turn off flame. Sprinkle freshly chopped spring onions. 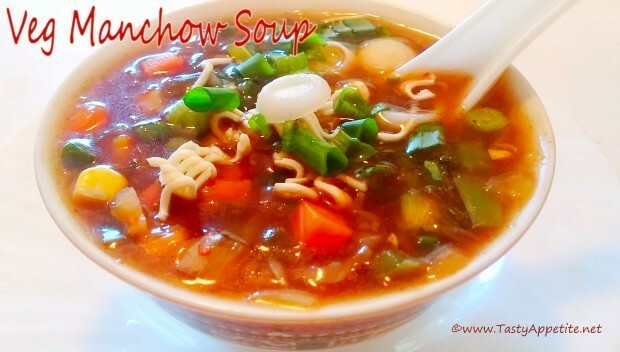 Flavorful delicious healthy restaurant style veg manchow soup is ready.